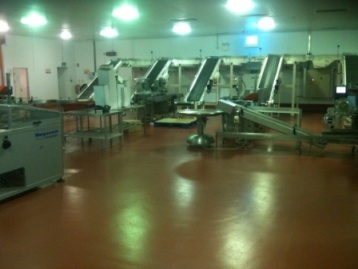 The food and drink industry requires the most demanding floor surfaces for manufacturing and processing areas. Epoxy Resin and Polyurethane food safe flooring systems are particularly suitable for industrial and commercial environments such as Food& Beverage Manufacture, Abbatoirs, Commercial Kitchens etc. Where a hard wearing attractive floor finish is required, the available resin flooring systems also assist cleansing where steam cleaning or pressure washing is part of the necessary cleaning regime. Food industry resin floors are designed to withstand regular stem cleaning, pressure washing, chemical clean-downs, extremes of temperature and impact damage, with properties such as anti-slip and enhanced chemical resistance being incorporated where necessary. Installation and maintenance can be carried out in proximity of foodstuffs using a range of non-taint resin flooring systems tested and approved by the Campden BRI Food and Drink Industry Research Organisation.